In 1955 she signed a seven year contract with Disney at $160 a week to rise to $500 a week if all options were exercised. 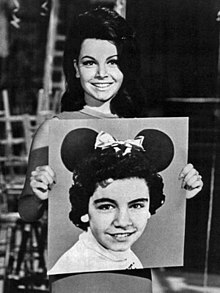 Funicello proved to be very popular and by the end of the first season of The Mickey Mouse Club, she was receiving 6,000 letters a month, according to her Disney Legends biography - more than any other Mouseketeer. In addition to appearing in many Mouseketeer sketches and dance routines, Funicello starred in several serials on The Mickey Mouse Club. These included Adventure in Dairyland, the second and third Spin and Marty serials – The Further Adventures of Spin and Marty (1956) and The New Adventures of Spin and Marty (1957), and Walt Disney Presents: Annette (1958) (which co-starred Richard Deacon). In a hayride scene in the Annette serial, she performed the song that launched her singing career. The studio received so much mail about "How Will I Know My Love" (lyrics by Tom Adair, music by Frances Jeffords and William Walsh), that Walt Disney issued it as a single, and gave Funicello (somewhat unwillingly) a recording contract. A proposed live-action feature Rainbow Road to Oz was to have starred some of the Mouseketeers, including Darlene Gillespie as Dorothy and Funicello as Ozma. Preview segments from the film aired on September 11, 1957, on Disneyland's fourth anniversary show. By then, MGM's The Wizard of Oz had already been shown on CBS Television for the first time. Theories on why the film was abandoned include Disney's failure to develop a satisfactory script, and the popularity of the MGM film on television. Disney ultimately replaced this film project with a new adaptation of Babes in Toyland (1961), which starred Funicello as "Mary Contrary". She had a multiple-episode guest arc on Make Room for Daddy as an Italian exchange student. Annette made her feature film debut in the Disney-produced comedy The Shaggy Dog (1959) with Fred MacMurray and Tommy Kirk. The film was a huge hit at the box office. Although uncomfortable being thought of as a singer, Funicello had a number of pop record hits in the late 1950s and early 1960s, mostly written by the Sherman Brothers and including: "Tall Paul", "First Name Initial", "O Dio Mio", "Train of Love" (written by Paul Anka) and "Pineapple Princess". They were released by Disney's Buena Vista label. Annette also recorded "It's Really Love" in 1959, a reworking of an earlier Paul Anka song called "Toot Sweet". Paul Anka was noted to have a crush on her, however, Walt Disney overprotected Annette, which broke Paul's heart. This resulted in his song "Puppy Love", which was inspired by his hopeless romantic crush on Annette. In an episode of the Disney anthology television series titled "Disneyland After Dark", Funicello can be seen singing live at Disneyland. Walt Disney was reportedly a fan of 1950s pop star Teresa Brewer and tried to pattern Funicello's singing on the same style. However, Funicello credits "the Annette sound" to her record producer, Tutti Camarata, who worked for Disney in that era. Camarata had her double-track her vocals, matching her first track as closely as possible on the second recording to achieve a fuller sound than her voice would otherwise produce. Early in her career, she appeared on the NBC interview program Here's Hollywood. In December 1959 Funicello attempted to have her contract with Disney set aside, claiming that it was unquitable and that she was without an agent or legal counsel when she signed it. She was on $325 a week. The court refused. In 1961 Funnicello returned to Zorro playing a different role. She starred in a big budget musical for Disney, Babes in Toyland (1961), alongside Tommy Sands and Kirk. She also appeared in two television movies filmed in Europe for Disney alongside Kirk, both of which were released theatrically in some markets: The Horsemasters (1961), shot in England, and Escapade in Florence (1962), filmed in Italy. Funicello moved on from Disney to become a teen idol, starring in a series of "Beach Party" movies with Frankie Avalon for American International Pictures. These started with Beach Party (1963), which was so successful American International Pictures signed Funicello to a seven-year contract and starred her in a series of beach party movies. Funicello guest starred on episodes of Wagon Train, Burke's Law and The Greatest Show on Earth, then did another two-part Disney telemovie with Kirk, The Misadventures of Merlin Jones (1964). This was released to cinemas in the US and became a surprise box office hit. Also popular were the follow ups to Beach Party, Muscle Beach Party (1964) and Bikini Beach (1964). When she was cast in her first beach movie, Walt Disney requested that she wear only modest bathing suits and keep her navel covered. However, she wore a pink two-piece in Beach Party, a white two-piece fishnet suit in the second film (Muscle Beach Party) and a blue and white bikini in the third (Bikini Beach). All three swimsuits bared her navel, particularly in Bikini Beach, where it is visible extensively during close up shots in a sequence early in the film when she meets Frankie Avalon's "Potato Bug" character outside his tent. Funicello made Pajama Party (1964) for AIP with Kirk, not Avalon, though it was an unofficial Beach Party movie and Avalon made a cameo. Avalon was back as Funicello's co star in Beach Blanket Bingo (1965), then she and Kirk did a sequel to Merlin Jones, The Monkey's Uncle (1965). The Monkey's Uncle featured Annette singing with the Beach Boys and was another huge hit. Funicello made a cameo in two AIP comedies starring Avalon, Ski Party (1965) and Dr Goldfoot and the Bikini Machine (1965), then she did How to Stuff a Wild Bikini (1965) with Dwayne Hickman. Box office receipts for the series were in decline, and neither Avalon or Funicello appeared in the final instalment, The Ghost in the Invisible Bikini (1966). AIP tried a new formula with stock car racing films, starting with Fireball 500 (1966) which starred Funicello, Avalon and Fabian Forte. The movie was popular enough for them to try another stock car movie, Thunder Alley (1967) with Funicello and Fabian. It would be her last lead in a feature film for two decades. Funicello guest starred on Hondo and had a cameo in Head. During the 1970s Funicello focused on raising her family. However she still occasionally acted, making guest appearances on shows like Love, American Style, Easy Does It... Starring Frankie Avalon, Fantasy Island and The Love Boat. In 1979, Funicello began starring in a series of television commercials for Skippy peanut butter. She starred in a TV movie for Disney, Lots of Luck (1985) then was reunited with Avalon in Back to the Beach (1987). The two would also perform together live. Her autobiography, dictated to Patricia Romanowski and published in 1994, was A Dream Is a Wish Your Heart Makes: My Story. The title was taken from a song from the Disney movie Cinderella. A television film based on the book, A Dream Is a Wish Your Heart Makes: The Annette Funicello Story, was made in 1995. In the final scene, the actress portraying Funicello (Eva LaRue), using a wheelchair, turns away from the camera — turning back, it is Funicello herself, who delivered a message to a group of children. Funicello's best friend was actress and singer Shelley Fabares. She and Fabares had been friends since they were young teenagers in a catechism class, and Fabares was a bridesmaid at Funicello's first wedding. She was also very close to fellow Mouseketeers Lonnie Burr (she later claimed in an autobiography that he was her first boyfriend during the first season of the Mickey Mouse Club), Sharon Baird, Doreen Tracey, Cheryl Holdridge, her Disney co-star, Tommy Kirk, and her Beach movies co-star, Frankie Avalon. She dated Canadian singer/songwriter Paul Anka and he wrote his hit song "Puppy Love" about her. Annette was raised in a Catholic family. Funicello was married to her first husband, Jack Gilardi, from 1965 until 1981. They had three children: Gina Portman (b. 1965), Jack, Jr. (b. 1970), and Jason (b. 1974). In 1986, she married California harness racing horse breeder/trainer Glen Holt. The couple was frequently seen at Los Alamitos Race Course and at Fairplex in Pomona in the 1980s and 1990s attending harness horse races. In March 2011, her longtime Encino, California, home caught fire. She suffered smoke inhalation, but was otherwise unharmed. After the fire, Funicello and Holt then began living full-time at the modest ranch that they had purchased decades earlier, located just south of Shafter, California (north of Bakersfield). That remained her primary residence until her death. 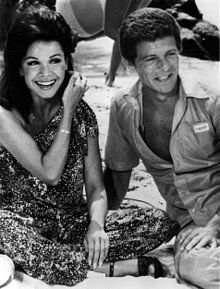 In early 1987, Funicello reunited with Frankie Avalon for a series of promotional concerts to promote their film Back to the Beach. She began to suffer from dizziness and balance issues, but initially kept the episodes from family and friends. In 1992, Funicello announced that she was suffering from multiple sclerosis. She felt that it was now necessary to go public in order to combat rumors that her impaired ability to walk was the result of alcoholism. In 1993, she opened the Annette Funicello Fund for Neurological Disorders at the California Community Foundation. On October 6, 2012, the CTV flagship current affairs program W5 profiled Funicello following her fifteen years away from the public eye. The program revealed that her disease had severely damaged her nervous system; Funicello had lost the ability to walk in 2004, the ability to speak in 2009, and, at the time of the profile, she required round-the-clock care in order to survive. In the profile, Holt and her closest friend, actress Shelley Fabares, discussed Funicello's state at the time, as well as the numerous medical interventions and treatments that had been attempted in order to improve her condition. 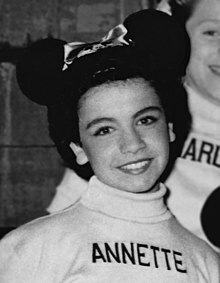 Annette was and always will be a cherished member of the Disney family, synonymous with the word Mouseketeer, and a true Disney Legend. She will forever hold a place in our hearts as one of Walt Disney's brightest stars, delighting an entire generation of baby boomers with her jubilant personality and endless talent. Annette was well known for being as beautiful inside as she was on the outside, and she faced her physical challenges with dignity, bravery and grace. All of us at Disney join with family, friends and fans around the world in celebrating her extraordinary life. Media coverage of Funicello's death was almost completely overshadowed by that of former British prime minister Margaret Thatcher who died on the same day. After her death, the Disney Channel Original movie Teen Beach Movie (2013) was dedicated to her memory. In 1992, she was inducted as a Disney Legend. She received her star on the Hollywood Walk of Fame for motion pictures on September 14, 1993, located at 6834 Hollywood Blvd. In the Disney Village shopping and dining area of Disneyland Paris, a 1950s themed restaurant, Annette's Diner, is named after her. Numbers in parentheses after title indicate peak position in Billboard charts. 1958 "How Will I Know My Love"
"That Crazy Place From Outer Space"
"Jo Jo The Dog Faced Boy"
1962 "That Crazy Place From Outer Space"
1965 "Something Borrowed, Something Blue"
1966 "No Way To Go But Up"
1967 "What's A Girl To Do"
b/w "When You Get What You Want"
1981 "(Together We Can Make A) Merry Christmas"
b/w "The Night Before Christmas"
^ McLellan, Dennis (January 9, 2009). "Cheryl Holdridge dies at 64; popular Mouseketeer". Los Angeles Times. ^ Virginia Jeanne Funicello. Pqasb.pqarchiver.com (September 6, 2007). Retrieved on April 20, 2013. ^ a b c "Annette Funicello Biography (1942–)". Crystal Reference, Biography.com. A&E Television Networks. 2003. Retrieved March 30, 2007. ^ Annette Funicello Fails to Set Aside Contract: Young Singer Wanted Court to Act on 1955 Pact Made With Disney Productions Los Angeles Times 18 Dec 1959: B14. ^ Article 2 -- No Title Los Angeles Times 10 Nov 1955: A1. ^ a b Annette Funicello shares life cheerfully PROFILE: The former Mousketeer thrives on the most demanding role of her life: herself. : [MORNING Edition] MARY JO GRIFFITH:The Orange County Register 21 June 1994: F04. ^ Disney Fake Book. New York: Hal Leonard Corporation. 1996. p. 74. ISBN 0-7935-4521-8. ^ "Annette Album Release". Discogs.com. Retrieved February 20, 2012. ^ a b "Oct 22nd Happy 65th Birthday Annette" (video interview). You Remember That.com. Archived from the original on December 24, 2007. Retrieved December 22, 2007. ^ ''Disneyland'' segment on YouTube (August 4, 2007). Retrieved on April 20, 2013. ^ Annette Is Getting Older...: Hollywood Korman, Seymour. Chicago Daily Tribune 7 Feb 1959: c3. ^ Ex-Mouseketeer Wins Thomas Role Los Angeles Times 14 Dec 1958: G6. ^ MAYOR, OUT WEST, SEES FILM STUDIO: Visits Fox Lot, Meets Stars and Governor Knight -- Blaustein Script Added By THOMAS M. PRYORSpecial to The New York Times 30 July 1958: 18. ^ By, FRED S. "HOLLYWOOD MULLS COURT DECISIONS." New York Times (1923-Current file), Mar 26, 1944, pp. 1, ProQuest Historical Newspapers: The New York Times, https://search.proquest.com/docview/106872448. ^ Annette Funicello to Star in Disney Film Hopper, Hedda. Chicago Daily Tribune 26 Jan 1961: a9. ^ Walt Disney Will Film Romantic Teen Comedy Hopper, Hedda. Chicago Daily Tribune 20 Aug 1960: n17. ^ "The Myth of the Hidden Navel". Beachpartymoviemusic.com. Retrieved February 20, 2012. ^ Cotter, Bill (1997). The Wonderful World of Disney Television. New York: Hyperion Books. ISBN 0-7868-6359-5. ^ "History of Skippy". Unilever. 2012. Archived from the original on May 18, 2012. Retrieved April 10, 2013. ^ Frankie Avalon, Annette Funicello at Golden Nugget Los Angeles Times 13 Jan 1991: F79. ^ Annette Funicello. People.com. Retrieved on April 20, 2013. ^ Oldenburg, Ann (March 12, 2011). "Annette Funicello suffers smoke inhalation down g fire". www.usatoday.com. Retrieved March 17, 2011. ^ Jennifer Self, "Annette Funicello's family: She fought until the end" Archived April 13, 2015, at the Wayback Machine, The Bakersfield Californian, April 8, 2013. ^ "Annette Funicello Fund For Neurological Disorders". California Community Foundation. 2008. Archived from the original on January 23, 2008. Retrieved January 28, 2008. ^ "Annette Funicello Research Foundation". Archived from the original on May 11, 2013. ^ "Annette Funicello: Her life with multiple sclerosis". CTV. Retrieved October 12, 2012. ^ "Disney Icon Annette Funicello From Utica Dead At 70 Years Old". WODZ. Archived from the original on May 11, 2013. Retrieved April 8, 2013. ^ Silverman, Stephen M. (April 8, 2013), "Annette Funicello Dies at 70 After Long Battle with MS". People.com. Retrieved on April 20, 2013. ^ "Funeral Services For April 11, 2013" Archived December 3, 2013, at the Wayback Machine, The Bakersfield Californian, April l1, 2013. Retrieved on April 23, 2013. ^ "Beloved Disney Mouseketeer and Iconic Teen Star Annette Funicello Dies at Age 70". D23. Retrieved April 8, 2013. ^ "Disney Legends". Disney. 2005. Retrieved September 27, 2007. ^ "Billboard Artist Annette Funicello". Billboard.com. Retrieved February 20, 2012. ^ TV.com (March 3, 1979). "Fantasy Island: Birthday Party / Ghostbreaker – Season 2, Episode 20". TV.com. Retrieved February 7, 2012. Wikimedia Commons has media related to Annette Funicello. Annette Funicello on LifeStory.com Share how she touched your life.